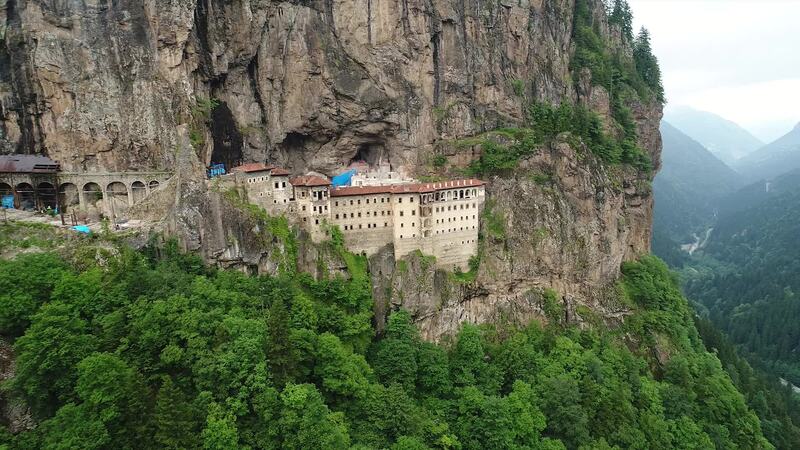 Description: Sumela Monastery is a old Greek Orthodox Monastery in Maçka district of Trabzon Province in Turkey. Nestled in a steep cliff at an altitude of about 1,200 metres facing the Altındere Valley, it is a site of great historical and cultural significance, as well as a major tourist attraction within Altındere National Park.The Monastery is one of the most important historic and touristic venues in Trabzon. Today the monastery's primary function is as a tourist attraction. It overlooks forests and streams, making it extremely popular for its aesthetic attraction as well as for its cultural and religious significance.The principal elements of the Monastery complex are the Rock Church, several chapels, kitchens, student rooms, a guesthouse, a library, and a sacred spring revered by Eastern Orthodox Christians.It has lots of frescoes are biblical scenes telling the story of Christ and the Virgin Mary.